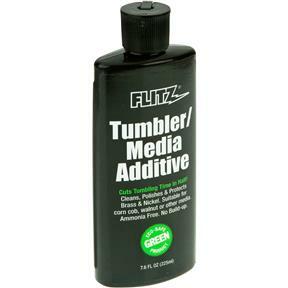 Tumbler Media Additive - 7.6 oz. Flitz TA 04885 - Tumbler Media Additive - 7.6 oz. Cuts tumbling time in half! Cleans, polishes, and protects brass and nickel, and is suitable on corn cob, walnut, and other medias. This eco-safe additive contains no ammonia and removes oxidation, tarnish, lead build-up, and fingerprints. 7.6 oz.